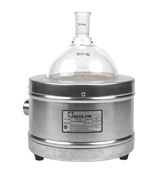 We often need to run chemical reactions at temperatures above room temperature or distill liquids. The dangers of Bunsen burners and open flames have led to many different ways to heat reactions to reflux. This guide details some of the more common methods used in a typical chemistry laboratory. Disclaimer: Regardless of the method you use to heat something, a stuck contact, an electrical short circuit, runaway chemical reaction or other malfunction can cause a reaction to heat to dangerously high temperatures. Do not leave experiments unattended and always take proper precautions. Fires and explosions can often result from the heating of chemical reaction mixtures. One of the most popular and safest methods to heat a reaction mixture in a synthetic organic, inorganic, or organometallic laboratory is a heating mantle, a resistively heated flexible fiberglass shell that conforms to the shape of the reaction flask. 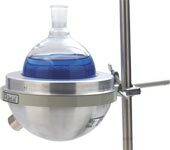 Most heating mantles are hemispherical in design and come in a variety of sizes designed to fit round bottom flasks from 50 mL up to 5000 mL or more. Now available! We now stock the complete line of Glas-Col heating mantles and accessories. Please visit our on-line store, Safety Emporium or click one of the items above. We have volume discounts on most mantles and accessories. Some heating mantles come in two piece designs that zip or tie together to enclose almost the entire flask except for the neck(s), but these are usually only used for special apparatuses. 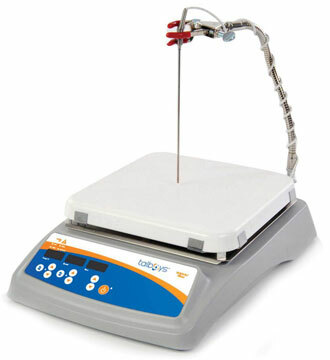 Heating tapes are also available which can be used to keep distillation columns warm or to regenerate catalyst columns. Now available! 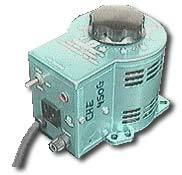 We carry a variety of temperature controllers suitable for use with heating mantles. Visit Safety Emporium for details. Remember that heating mantles and Variacs are electrical appliances, so follow the appropriate precautions. To prolong the life of your heating mantle, clean up spills (solid or liquid) right away. Except for the cord, mantles are not generally repairable. If the fiberglass is brittle or cracked or if any wires are exposed then discard the heating mantle. Never immerse a heating mantle in water or other liquids (or place these in the mantle) and always use a properly grounded outlet. Do not allow the cords to dangle down the front of the lab bench or hood, a snag/trip danger. Some older models of Variacs will keep whatever is plugged into them electrically live even though the Variac is switched off! Touching this device and ground at the same time could complete a circuit with your body and lead to electrocution. Variacs also find use around the laboratory for other purposes, such as controlling the heating of a high vacuum line diffusion pump or the rate of a stirring motor. Fluids have good thermal transfer coefficients and are an effective way of heating reactions. The simplest bath we can think of is a hot water bath, however even at 70 degrees C, water evaporates too quickly to make this a practical bath fluid for most purposes. The key, then, is to find a bath fluid that does not evaporate readily and is not flammable at the temperatures being used. This depends on knowing the flash point of the material, i.e. the point at which the bath material can form a flammable mixture with air at the liquid interface. NEVER heat a bath fluid above its flash point (and as a good rule of thumb, not even within 20 degrees of its flash point). 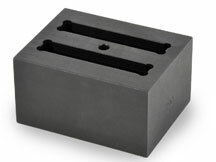 Fluid heating baths are inherently dangerous, and a heating mantle or solid (dry) bath material should be used instead unless absolutely necessary (see below). A hot fluid can be easily spilled or spattered, especially if water is accidentally introduced into a hot fluid. In addition, there is an electrical heat source in close proximity and a hot bath is very difficult to deal with in an emergency situation. Bath fluids expand upon heating, so overflows are another potential pitfall. 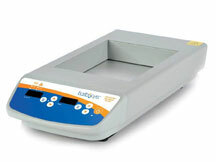 Despite the potential hazards, fluid heating baths are sometimes used by chemists instead of heating mantles because of their convenience and ability to prevent thermal fluctuations. For example, it would be extremely difficult to heat an NMR tube with a heating mantle, and the temperature would be very difficult to monitor. For the best thermal stability, magnetically stir the bath during operation. The bath container is typically a beaker or large crystallizing dish. This is convenient because you can usually see your reaction flask through the bath. 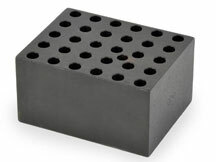 For very high temperature materials, a metal container is sometime used, although this can present a shock hazard if the apparatus is not properly grounded. Here are some bath materials commonly used in chemistry laboratories. No waste disposal for used bath. Easy to clean up if spilled. Evaporates quickly at relatively low T.
Turns brown and polymerizes with prolonged use. Spatter danger from leaking water. Slippery, hard to handle, esp when hot. High bp; tempting to take above flash pt. Doesn't degrade as easily as mineral oil. Clean up by scraping and reusing wax. Greater working range than mineral oil. Toxic (use in fume hood!). Hard to handle, esp when hot. Reaction flask can be hard to clean. Good choice for moderately high T.
Can be corrosive or react with certain vapors. Caution: Some mixtures in the literature are reportedly explosive; never mix an oxidizer with a reducer! No practical temperature limit, non-flammable. Can use a heating mantle as the container. 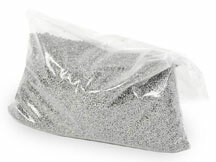 Non-toxic, easy to clean up and reuse. Chemically inert to organic materials. Slowest to heat and cool. If you need to use a fluid bath for a kinetics run, NMR tube experiment etc., silicone oil is a good choice for temperatures below 200 degrees and molten salts are a good choice for temperatures 200-500 degrees C.
You'll notice that we list sand as the last entry in the fluid table. Solid (dry) heating baths using sand, inert shot, and similar materials are superior as they pose no spatter danger, are non-flammable, are non-toxic, and generally don't degrade. Solid baths are a great choice when you have an odd-shaped apparatus and don't want to use a fluid. Commercially available solid baths are discussed in the next section. 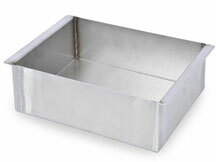 Hotplates or stirring hotplates are probably the easiest and most common way to heat a fluid bath. 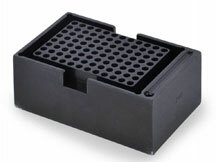 However, the final working temperature of the bath is limited by the poor thermal contact between the top of the hotplate and the bath container. In addition, the hot surface of the hotplate presents a safety hazard in its own right and the excess heat absorbed by the surrounding apparatus can create additional problems. Spills of fluid on the hot surface can lead to discoloration, failure of the ceramic top or a fire (because the temperature of the hot plate will be much hotter than the temperature of the bath). Finally, note that virtually every hotplate or stirplate available you find is not explosion-proof, so if the bath material is heated above its flash point a fire and/or explosion could occur. Resistive heating coils made of coiled Nichrome or Chromel wire are often used as immersion heaters for oil baths. This coil is typically placed in the bottom of the bath and is connected via banana plugs, alligator clips or pinch clamps to a standard electrical plug which is plugged into a Variac to control the heating output. These are INCREDIBLY DANGEROUS and it is with good reason that they are called suicide cords in common lab slang. Exposed electrical wires are a very dangerous situation and should be avoided at all times. Accidentally contacting a wire or even the bath material could lead to electrocution. NEVER use an immersion heater that has exposed electrical contacts. Additional warning: Some older models of Variacs will keep whatever is plugged into them electrically live even though the Variac is switched off! Touching this device and ground at the same time could complete a circuit with your body and lead to electrocution. 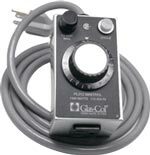 Always disconnect a Variac from the outlet before working with the device plugged into it. You can read about someone who died in a similar scenario. A good immersion heater, with no exposed contacts and connected to a grounded Variac, can afford temperature stability comparable or better than a simple hotplate and can be just as easy to use. This page was last updated Wednesday, March 15, 2017.